PILDAT, has termed the perception of the pre-electoral process leading up to General Election 2018 to be Unfair. This conclusion was reached after carrying out a pre-election assessment using an 11-point Pre-poll Fairness Framework. 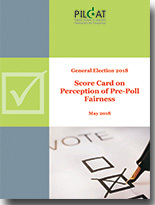 In the Pre-Election Assessment Report with a Score Card on Pre-Poll Fairness Perception, PILDAT has carried out a systematic review of the developments relating to the electoral process during the Pre-poll phase spanning over a period of around 12 months starting from April 2017 up to March 31, 2018. Judging the perception of overall fairness of the pre-poll environment spanning over 12 months, PILDAT has given it a score of 51.5 on a scale of 100. This, according to the scale shown above, indicates that the pre-poll election phase has been unfair so far and, if the direction of the developments remains unchanged, the prospects of the entire electoral exercise to carry a degree of credibility are not very bright. The assessment was guided by a careful review of over 70 relevant key developments over the past one year and by scores assigned by members of PILDAT Dialogue Group on Civil-Military Relations (DGCMR) using a framework devised for this purpose.